Sunday morning service is at 10.30am. 'Our Children' meets at this time for those aged 3 to 11 and there is a creche for the under 3s. Once a month, the morning service includes Holy Communion. Tea and coffee are served after our 10.30am services, enabling us to meet each other and greet visitors in a relaxed atmosphere. Details of our services can be found on posters near the entrance to our church. Palm Sunday. All age worship. Once a month, the morning service includes Holy Communion. 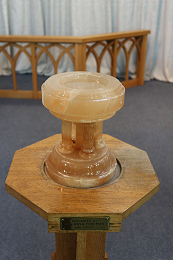 Unless the service is a Family Service the children will go into 'Our Children' at 10.30am and will then join the adults for Holy Communion towards the end of the normal morning service. The attached document should answer any questions you might have about Holy Communion at East Molesey Methodist Church. Are you looking for a wedding venue that won’t cost the earth? There is a beautiful Victorian church tucked away in Manor Road, East Molesey, which is large enough to seat all your guests but small enough to have a friendly, homely atmosphere. The ground floor has been refurbished to make it more comfortable while it retains the original gallery so some of your guests can have a wonderful view of the ceremony from above. There is a pipe organ and a grand piano to accompany your choice of hymns. The church will provide your wedding with the reverence that your special occasion deserves. East Molesey Methodist Church welcomes people who are being married for the first time, or starting married life over again. To find out more, please contact Revd David Innes by email (Minister@emmc.org.uk). He will be happy to answer any questions you may have and arrange a visit so you can look round the church. We have put together a document which we trust will answer some of your questions about weddings at East Molesey Methodist Church. We have put together a document which we trust will answer some of your questions about Baptism/Christening at East Molesey Methodist Church. Who has believed our message and to whom has the arm of the LORD been revealed? He grew up before him like a tender shoot,and like a root out of dry ground. He had no beauty or majesty to attract us to him, nothing in his appearance that we should desire him. 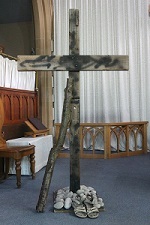 The congregation remain standing as a piece of dry wood is brought down the aisle and placed prominently at the front of the church, and for the prayer and Bible verse. Our Gift service takes place on Sunday 9th December.